Ensuring passengers in rural communities receive reliable transportation. MTM’s Certified Community Drivers give back to their community by transporting Medicaid and Medicare members. Increased access to medical services for members and personal growth for Certified Community Drivers. Access to medical care is vital to helping Medicaid and Medicare members live healthy, independent lives. For state agencies, health plans, and managed care organizations charged with providing non-emergency medical transportation (NEMT) to members, serving passengers in rural communities or areas with insufficient transportation resources can be a point of concern. MTM’s clients often seek alternative, innovative approaches for arranging NEMT in areas that would otherwise rely on inefficient long distance trips to pick-up and drop-off members. Deploying vast networks of Certified Community Drivers eager to give back to their community is one way MTM achieves this. MTM’s clients often seek alternative, innovative approaches for arranging NEMT in areas that would otherwise rely on inefficient long distance trips to pick-up and drop-off members. Deploying vast networks of Certified Community Drivers eager to give back to their community is one way MTM achieves this. When sufficient and reliable transportation resources are not available in a service area, MTM supplements our traditional contracted transportation networks with volunteers. With nearly 44% of Americans seeking volunteer opportunities each year, this method has proven particularly effective in states with largely rural communities, like Wisconsin and West Virginia. While efficiency is the goal of this model, passenger safety is our ultimate concern and is never compromised. Certified Community Drivers are fully vetted by MTM and undergo a thorough credentialing process. Only experienced, safe drivers are accepted into the program. Guiding drivers every step of the way, our dedicated Coordinators assist drivers in submitting credentialing documents and completing training activities. All Certified Community Drivers are held to the same standards as transportation companies in our contracted networks, and must provide satisfactory personal and vehicle credentialing information before joining our networks. 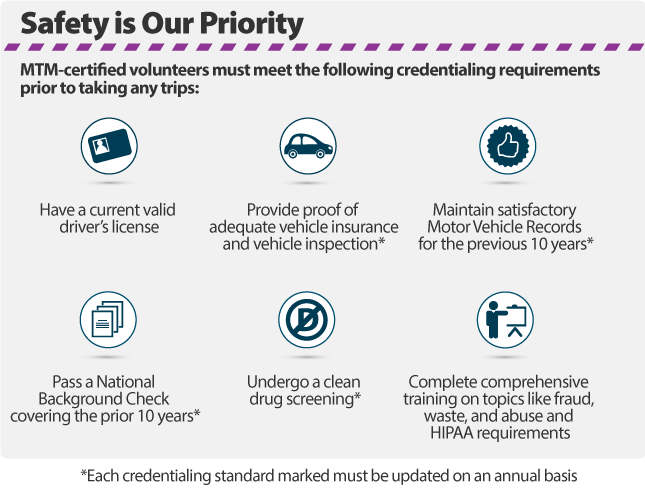 Credentialing information is updated annually to ensure drivers continue to meet our qualification standards. Additionally, our Education, Training, and Outreach (ETO) team works with members and medical facilities to monitor satisfaction with volunteer services. When MTM pairs members with Certified Community Drivers, we realize significant benefits for everyone involved: members receive dependable access to their medical appointments, volunteers achieve personal growth, and our clients experience extensive cost savings. In particular, our implementation of this model for our statewide NEMT contract in Wisconsin has been extremely successful. Each month, our Wisconsin Certified Community Drivers complete approximately 1,500 one-way trips. Transitioning these trips from our typical contracted transportation providers to Certified Community Drivers ensures that members in even the most remote areas of the state have reliable, timely access to transportation for their routine healthcare. Additionally, this transition has saved valuable program funding and taxpayer dollars. On average, Certified Community Drivers offer a $65.99 savings per every one-way trip, resulting in an annual savings of nearly $1.2 million. Volunteering to drive is truly an act of altruism; our drivers are dedicated to giving back to their community. In many cases, Certified Community Drivers are seniors themselves who enjoy driving and are seeking a way to remain active in their community while helping others. The results are Community Driven: an engaged network of volunteers who connect with their passengers to create lasting relationships and remove community barriers. Working with MTM is an excellent way for volunteer drivers to give back to their community while setting their own hours. The challenges of others are hard to imagine sometimes. I’ve watched the struggles from afar, wishing I could do something to make a difference or make someone feel better. With MTM, I feel as if I’m making a difference every day in the lives of those unable to get to their medical appointments. I’ve met some really wonderful people who appreciate the service they get, as I open doors for them, carry bags when needed, and drive. When a lady said to me, ‘You really care, don’t you?,’ it made my day.